The village from the farm. “Vivian! You are just in time for check in. Two sentences that say where you are right now.” Michael, one of the longest-term members to live onsite at The Yarrow Ecovillage, is facilitating our monthly community meeting. As I turn the corner I let out a sudden gasp of delight. My neighbours and neighbours-in-waiting are gathered in the old bunker silo that doubles as a sun shade, rain shade, community kitchen, and bike shed. There are about four old couches filled with smiling faces. Chairs and benches make up a second ring of smiling faces. We have become an enormous group. The oldest members and the very newest all gather together to go through the business of the day. I run back for my camera. Some memories are worth taking pictures of. The meeting is full of important details about the filing of legal documents, community contribution hours, and the startling realization that in 20 days our bunker silo needs to be emptied for demolition. Demolition!? How can that be? I joined this project two short (and very long) years ago and every meeting, BBQ, and other important community moment has happened in this barn. When I came here last summer the barn was my kitchen and comfort. I’ve had long talks by candlelight in this barn! I’ve played men-against-women pictionary in this barn (and the women won, by the way!). And now it is coming down to make room for the final stage of construction. In two and a half short years we’ve gone from no buildings to 16, and now we count down the months to our final construction. Did we make mistakes? Certainly. We could write a whole book about things we’d recommend no other group do. I think I can safely say we have done one thing very well. We consensed that cohousing be the mechanism to do the housing portion of the ecovillage. At The Yarrow Ecovillage we strive for a more sustainable life by relying on a deep sense of community. Years ago the community (then very small) asked themselves a defining question: “If you can only choose one, which is the higher value? Community? 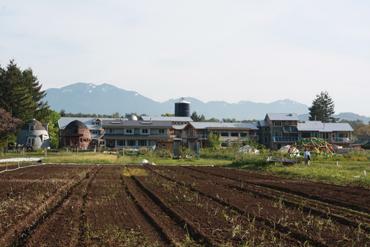 or Sustainability?” The answer came back a resounding “Community.” Not what you’d expect from an ecovillage. May I defend? The reason was that by prioritizing strong community connections, sustainability would naturally follow. We are surrounded by like-minded people who teach us, push us, and offer us helping hands in a way that lets every family strive for a higher level of sustainability. Some families are more committed, or farther down the path of learning than others. We allow for imperfection as we all learn and grow. We’ll all do better next time. By placing community as our highest priority we have also become attainable to a broader group of neighbours. We actually have homes to sell people! We have a site plan, and a common house. People know what they are getting into. People also don’t have to feel like the perfect vegan yogi to come here. All we ask is that they respect our prior agreements, and that they are personally striving to be a little bit better every day. I really think the cohousing model helps us achieve that. While our homes are not the cob, strawbale, or yurts we once sort of wished we could build, the more conventional cohousing homes that Charles Durrett has designed for us hold human connection as the highest priority. Everything, from the distance of front doors and the set-up of the mail room in the common house to the locations of our gathering nodes, is designed with the highest level of human contact in public spaces balanced with high levels of privacy in private spaces. This allows for us to live in close proximity without being stuck in each other’s faces all the time. We like it very much. Cohousing—or in our case “eCohousing”—has been in North America for over 30 years since Charles Durrett and Kathrine McCammant brought it from Denmark. In 30 years over 150 cohousing communities have been built across the US, and another 25 in Canada. More begin development every year. The major hurdle for cohousing projects tends to be the acquisition of land. In our case land was not a problem. We had 28 acres of land and not enough people to get all the work done. By bringing Charles on board we were able to attract more people quickly. Every family that comes brings new talents and new ways to have fun. We are on a roll. 1. If possible, hire a cohousing architect before you build any of your buildings. A good place to start looking is the cohousing.org site, or in Canada, cohousing.ca. We had some existing buildings from before Charles came into the picture—our “phase one” of development. It was difficult, but not impossible to work around them. They are pretty, but they impacted the flexibility of the overall site plane. 2. We did have one shortfall within the process: front closets were a priority that was not met. Because we are a farming community, an entire mud room in each house would have been very nice. In the end we’ve found ways to adapt and meet our needs; however, I think this miscommunication could have been avoided by holding a community meeting to discuss the plans before Charles arrived to garner our feedback. When he comes, his time is spent very quickly between city officials and community meetings. His time for feedback is limited. Community efficiency would have helped us immensely. 3. Stay away from any custom homes. They will surely cause your community more strife than they are worth. Consider that in cohousing your highest value becomes your community connections. Our experience has been that custom homes have cost both the custom home owners and the community at large more stress than they are worth. I think a good rule to adopt would be to allow only floor plans that are used at least twice in the site plan. If someone wants to design something custom, it should be fine as long as it is salable to more than one family. This will go a long way to fairness in the sales you have to do to newcomers. As the head of marketing I can tell you that it is difficult to explain to newcomers why some of our units are so specialized when the other 18 are exactly the same as each other. 4. As much as possible build all of your units at the same time. Phases of development are tiring and costly. You stand to save a large amount of money by building out simultaneously. It is also nice to do one big move-in month rather than having some people afar and others on-site. 5. When cohousing architects speak, please listen to them. They do know what they are talking about. While we’ve almost completed our multigenerational cohousing project, we’ve also begun a seniors cohousing group. In the final picture our ecovillage will be a 20 acre organic farm, a multigenerational cohousing, seniors cohousing, and commercial development. We are on the main street of a small town with all of our basic needs within walking distance. The journey has been long. Thousands and thousands of hours have been put into our project to date. Love, frustration, and overwhelming commitment will get us to completion. (Is there such a thing?) As we celebrate 10 years since we bought the land, I can tell you that adopting cohousing has allowed us to move at a much faster rate. I believe the key to our long-term success will be the human-centred architecture cohousing has brought. And what luck for me that this is my sweet home! ● ● ●For more information on cohousing you can read Creating Cohousing by Charles Durrett and Kathryn McCamant (we’re a chapter in the latest edition). See also the websites www.cohousing.org and www.cohousing.ca.